I came back for their final market of the year, it was a much nicer day, and there was a little more traffic. 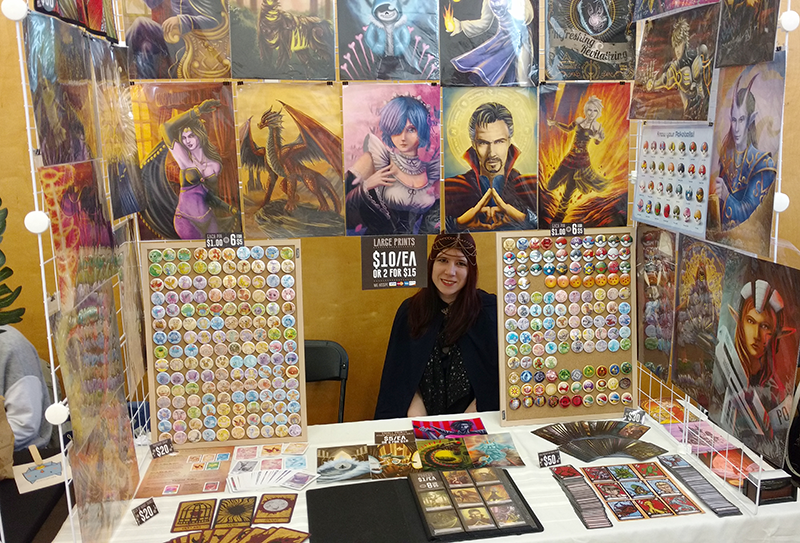 I got to interact with more of the local gaming community in a different kind of setting here, and I also got to play with a new kind of table layout! I had a lot of fun, and I may try them out again in the spring and summer. this is a smaller local market, I've thought about trying them out in the past but haven't given it a shot before now :) it was kind of fun to interact with people from the local community, as a smaller market I didn't expect much, but I was happy with the few people I did get to interact with. I'll probably do them again in the future. 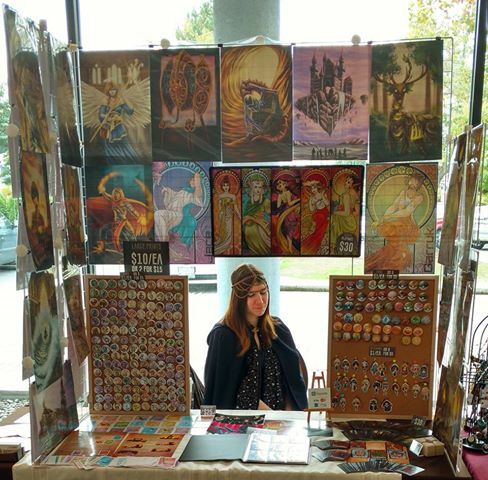 This one ended up being a very small event, but I still had a good time, I got to debut my new Star Wars buttons and show off my Sabaac prototype. I ran into some fun M:tG players as well as some familiar faces from other conventions! Overall I had a good time and will consider going back next year! 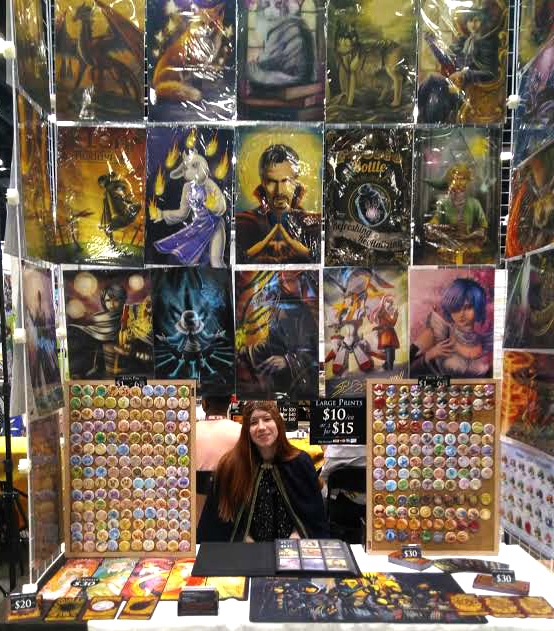 I had a very good time at AR! 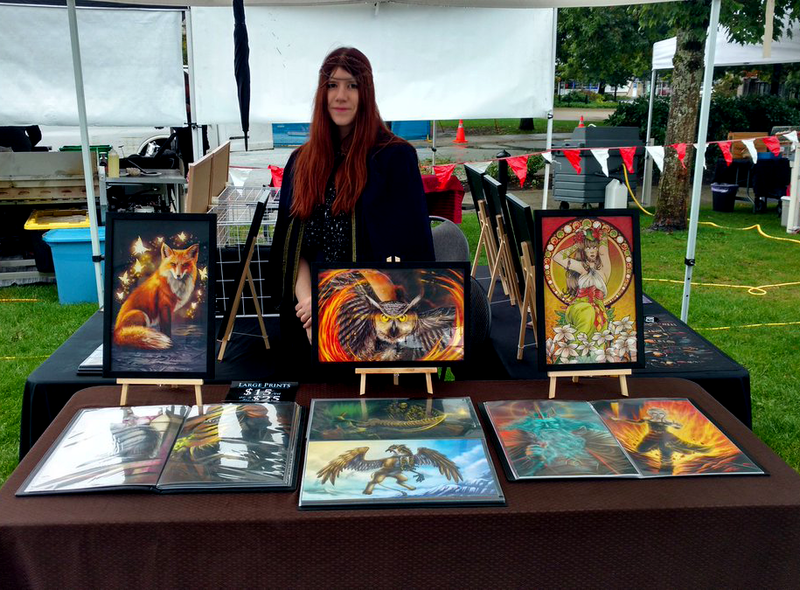 I'm always a little intimidated because it is a larger con and the skill and caliber of the artists there is so high, I always feel like I am not going to sell anything, especially prints because everyone else there is so skilled and their stuff is so beautiful! but I did okay! I even managed to sell some original prints! Which always means a lot, because it says that the person really liked the artwork! I'm still very humbled and joyful whenever someone buys a piece of original art! I had such a good time I'll be going back for sure next year! I did okay at this one, I was on the ground floor with the vendors this time, which was mmuch better than being upstairs like last year. 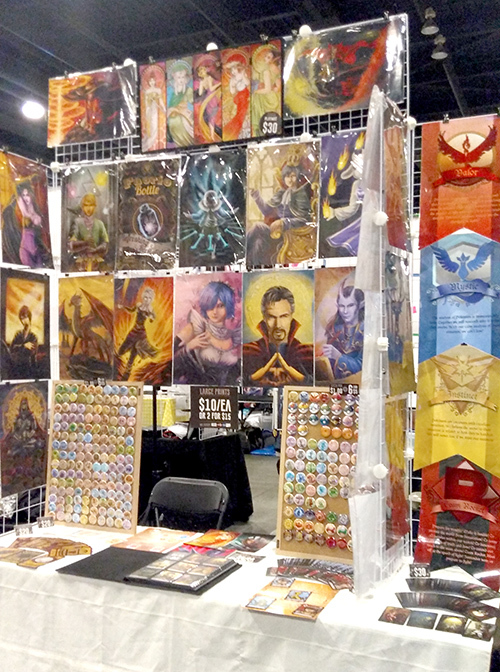 I didn't sell a ton of stuff, but I did sell a lot of Triple Triads and Zelda prints, and meeting the Magic players is always a good time! I might go back next year depending on what is happening that weekend. This was a suprise, I didn't initially get picked, but was chosen off the waitlist (I guess someone else cancelled?). I did alright, one of the bigger conventions I've been to, but suprisingly, not as busy, AniRevo was actually a better con for me, which was a little disappointing, because I was only at AniRevo for a day and the table was a third of the price. Regardless, it was a still a fun show. The other vendors around me were kind and pleasant people to interact with, I found some Magic players, some Undertale fans, and even some quirky cosplayers. Overall it was a good convention, and I may return next year. AR was definitely the biggest convention I've done so far, and it was kind of intimidating, needing two pieces of ID to sign in was definitely a first. And when I walked in there were so many amazing artists, I felt kind of out of place. It was my first time at AR and I wasn't really sure what to expect, but I figured with so many amazing people there I probably shouldn't expect much. 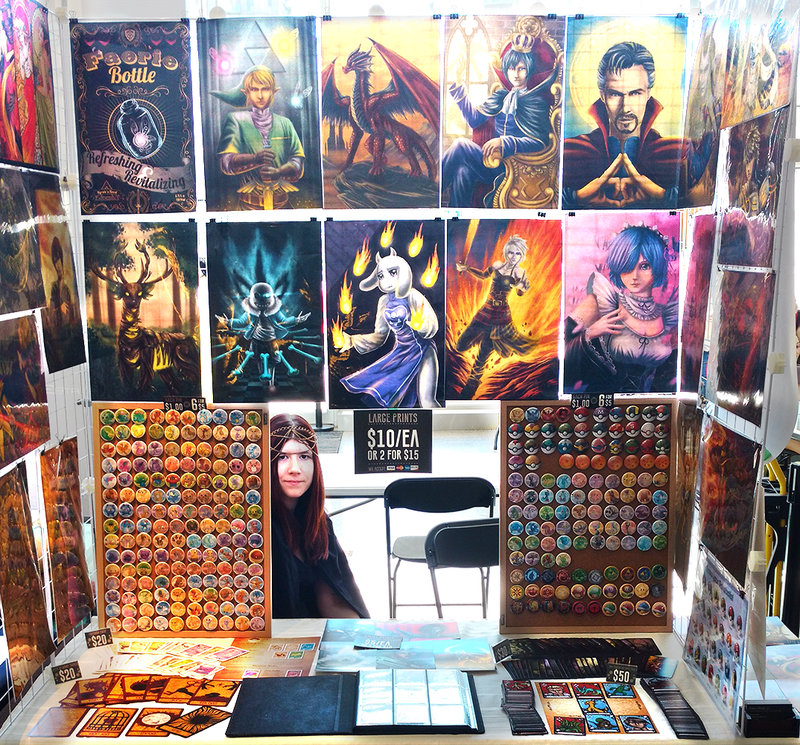 I was at the back of the hall with just a 1 day booth (this was an experiment, to see if I was ready for larger conventions). 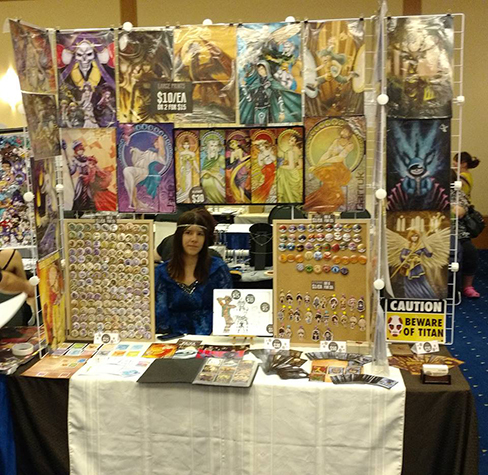 I was also alone, the person that usually helps with the booth was working, so set up was difficult, luckily the other vendors around me were very helpful! 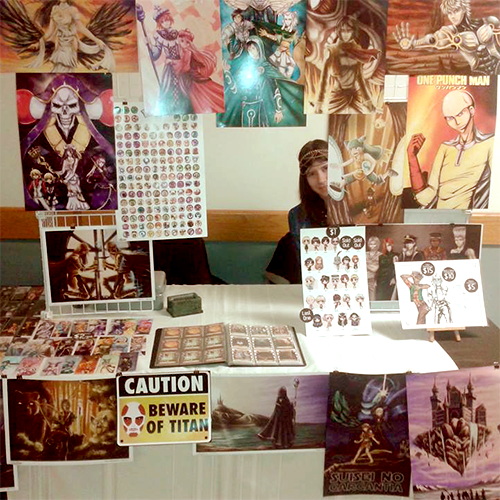 The table was shorter than other conventions so I went for a display one row higher than normal and a little longer. 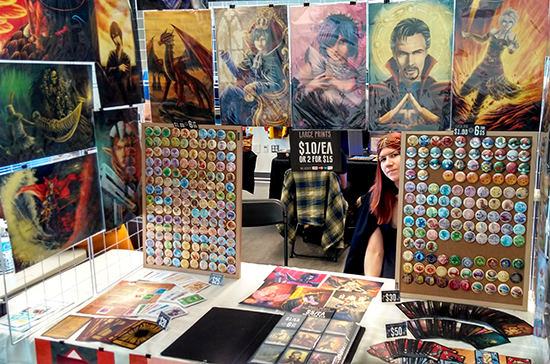 Overall I was blown away with how well I did, I didn't sell a lot of prints, which was expected, considering the competition, but pins and cards sold insanely well! I met some fantastic magic players there, made friends with the artist beside me and even touched base with the cult guys again :) I'd say next to Tsukinocon it was my best con of the year! I will definitely get a 3 day booth next year if I can! 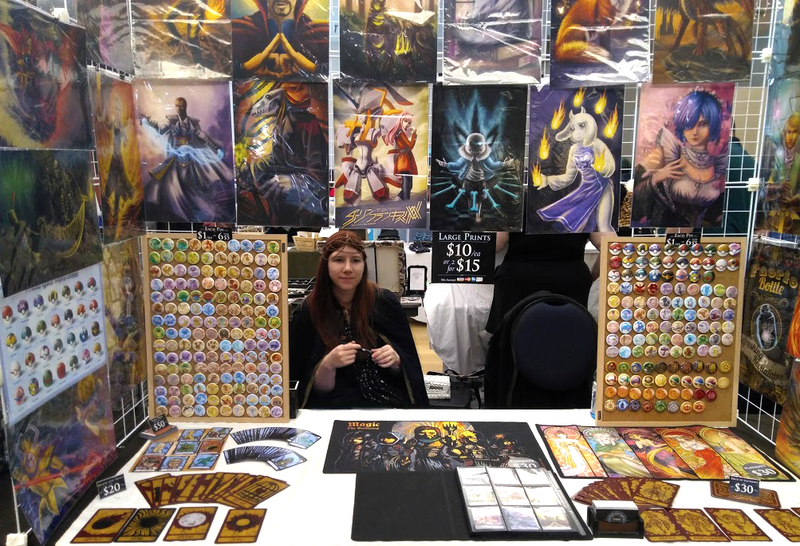 I'm looking forward to my next set of conventions, I've applied for Fan Expo, but am not sure if I'm in yet, and i'm going to apply for Tsukinocon when it's up! 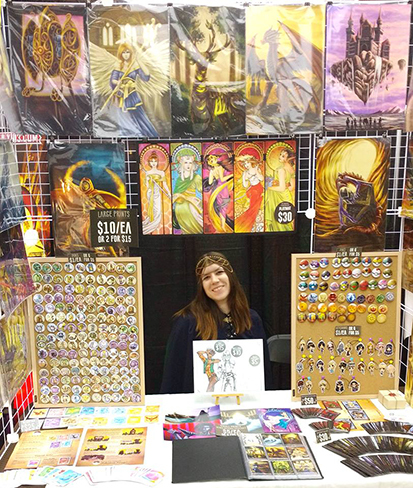 Overall this year for conventions was a HUGE success, I've done better than I ever would've imagined, and am very excited to work hard, improve my art and bring some beautiful things into the next season! 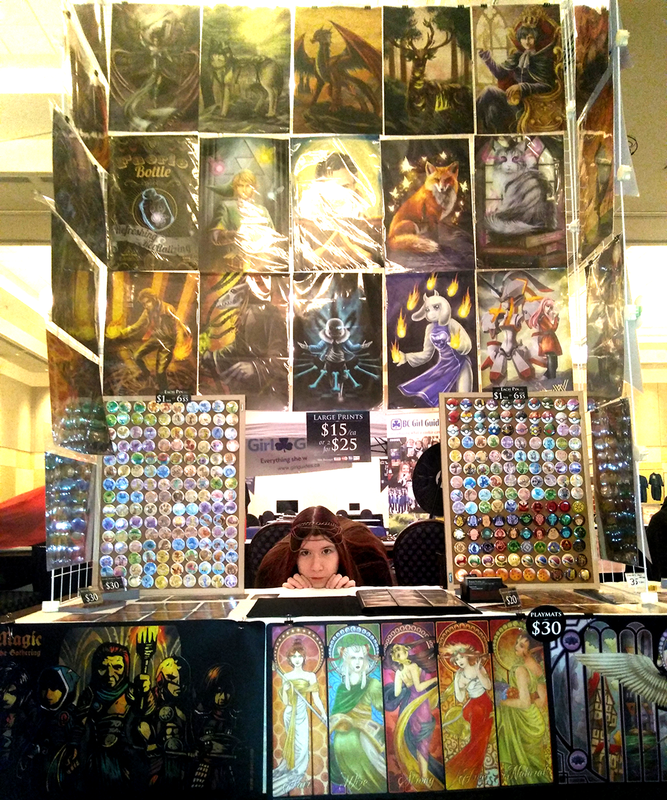 AE went okay, at first my table placement was pretty poor, but about an hour in I noticed a bunch of vendors failed to show up and asked if I could move to one of the empty tables, they agreed and I managed to get a significantly better position. overall I did okay, it certainly wasn't my worst con of the season, but it also wasn't my best either. a highlight is I got to see some familiar faces again, karu crafts was there, as well as the fantastic guys that made Cult (check out this game if you haven't heard of it) as well as the cool dudes from Core Games. 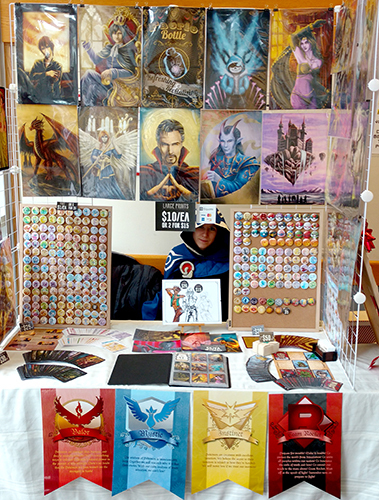 This convention went moderately well, I feel like my table location wasn't as stellar as it was in the previous conventions, and I do believe it impacted my sales negatively. However, traffic was still pretty steady and the attendees seemed happy, as well as the other artists. I'll definitely be going back next year, as their coordinators post-convention correspondence was the best I've seen out of any convention! Tsukinocon 2017 was INSANE! I was super busy & had a lot of fun! I didn't accurately guess how insane the pokemon pins were going to be! The project was a huge hit! by the end of the convention I was completely out of pin parts (I make the pins to order) and was selling them right off the boards :S! 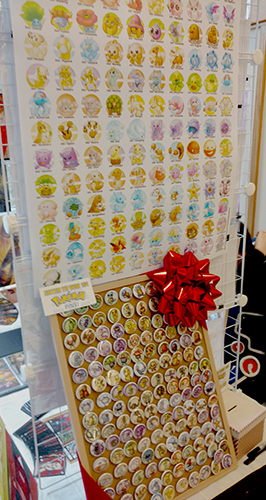 I also ran a draw that was a huge success to raffle off my old Pokemon pin board! I was suprised at how many people wanted to enter the draw! in the end Gavin was my big winner! I was so glad to be there and hope I get to go again next year! convention went very well! Much better than last year! I will be giving them another shot next year. 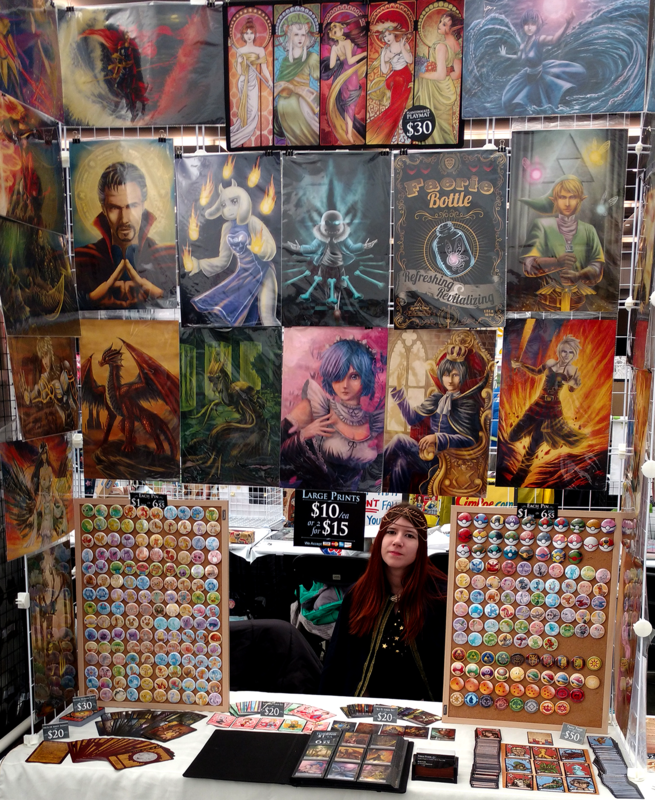 many people stopped by and picked up their favorite pokemon pin, or a print (sold more original prints than I expected ^.^) also sold out entirely of my Sans print :3 I also met a ton of interesting people & got to high five some fellow mystic players. got to gush about cards with some magic players & picked up a copy of Symetra! I applied for two jobs to paint book covers (crossed fingers) As well as submitting my novel to Edge publishing for examination! 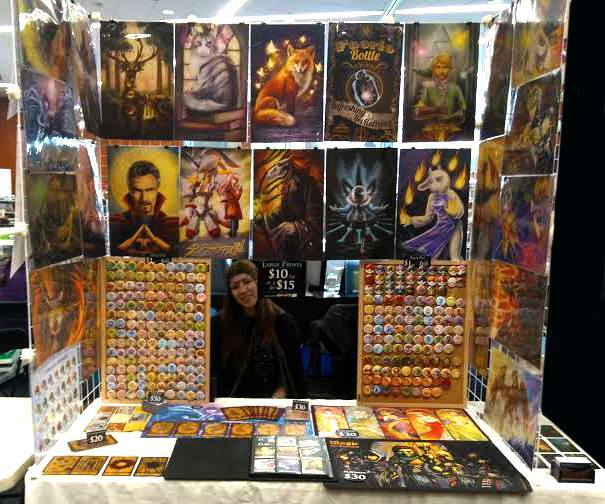 (the guy who I gave the manuscript to recognized me later in the convention and I had one of those 'Senpai noticed me moments') overall very fun & profitable weekend this lovely (haha) photo was my booth, you can't see the stuff on the sides, but w/e. 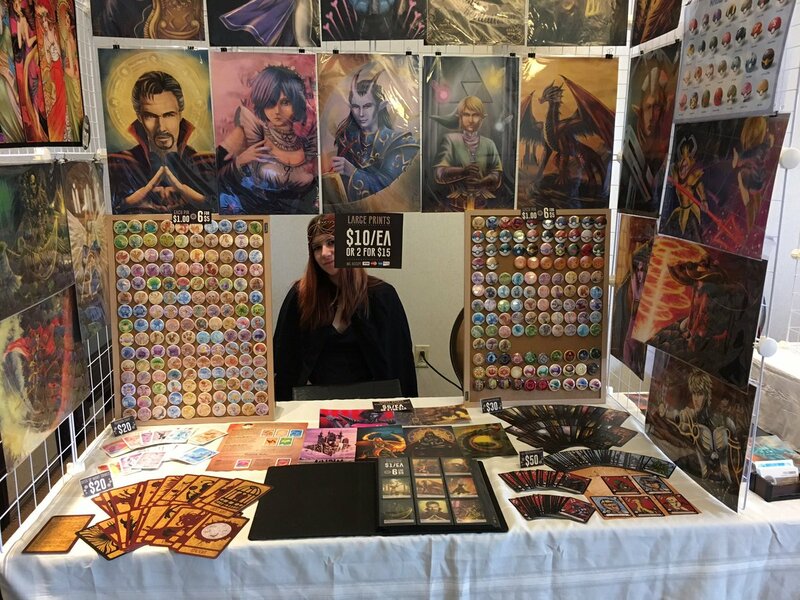 I also don't know when wez took this picture but this is probably the worlds worst photo of me -.- my expression is NOT indicative of how I felt over the weekend :P thanks to everyone who stopped by & I can't wait to see you all next year!